Former rodeo star Wyatt Emmerson leads a quiet life. He’s busy working with his dad and raising his daughter on his own. 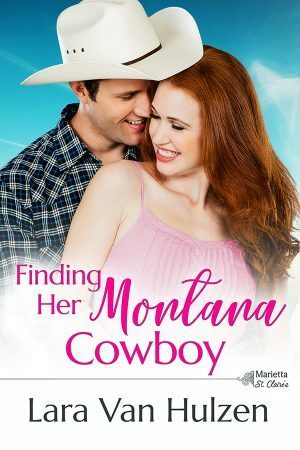 Romance is the last thing on his mind, but when McKenna St. Claire crosses his path, life takes a turn that Wyatt never saw coming. McKenna doesn’t sit still well; traveling the world has always been her favorite pastime. She’s vowed to stay in Marietta for her family, but is ready to pack her bags as soon as her twin nephews are born. But a wounded cowboy and his young daughter steal her heart, making her question what she really wants in life. Will she take a risk on love and call Marietta her home? This series follows the St. Claire siblings. While the books follow a definite timeline, each book can stand on it's own. You just might be happier if you read them in order. McKenna has popped up in past books and it was good to finally get her story. She is known as the family wanderer, the world traveler. Now she is hoping to stay near her family and share in those celebrations and relationships she has been missing out on. I loved McKenna's innate desire to help people and to prove herself useful. Wyatt has had his time in the limelight and now he is ready to settle down and provide a steady home for his daughter. I loved Wyatt's solid feel, the way he dug in deep and worked hard. He was easy to love. - I received a complimentary copy of this book from the publisher at my request. All opinions expressed are my own.